Members of the public have the right to request records containing their personal information from the Ontario Provincial Police or a municipal police service. Individuals who make these requests may have, for example, played a role in a suspected offence, been involved in a call for service or some other police-attended incident (as a complainant, victim, accused person, witness, etc.) or had a relative who died in circumstances that led to the involvement of a police service. Someone else, such as a lawyer or other person acting on your behalf, may make the request for you, or you may do so yourself. 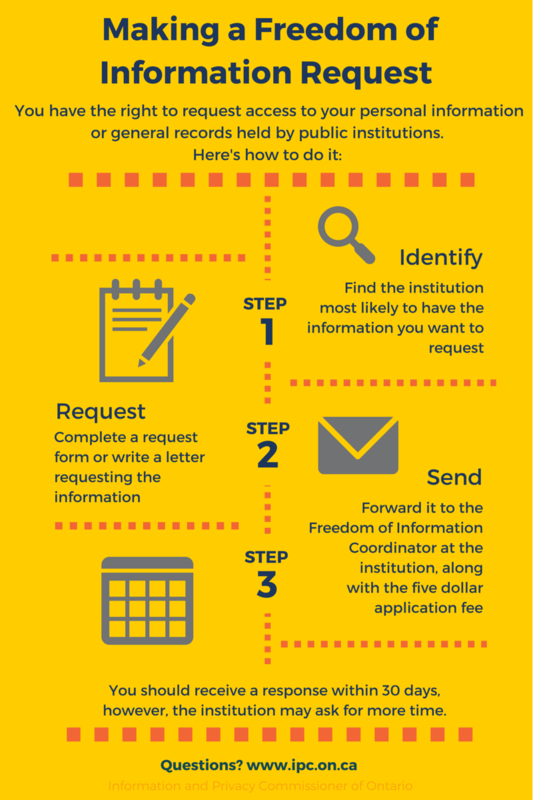 You may file a request by submitting a form and paying a fee, either by mail or in person. Many people think that they cannot request a police officer’s notes, but a police notebook is generally in the custody or control of the police service and is subject to freedom of information requests. Requesting information from a police service follows the same process as asking for records from other types of government institutions. However, the nature of police-held information means that frequently some of these records — or some passages within these records — are exempt from disclosure under Ontario’s access to information legislation. There are two kinds of exemptions: mandatory and discretionary. A police service cannot release a record if it is covered by a mandatory exemption. An example of this is if you ask for someone else’s information, and disclosure to you would be an unjustified invasion of that other person’s privacy. In the case of discretionary exemptions, a police service may disclose the information even if the exemption applies. Many requests individuals make to a police service for their personal information are subject to discretionary exemptions. This means the police service will weigh your right to access against other factors before issuing a decision. In all cases, if you disagree with a police service’s decision to deny your access request in whole or part, you may file an appeal with our office.